This entry was posted in Rescued Dog and tagged #dogblog, #dogpark, #dogs, #dogtreats, Uncategorized by admin. Bookmark the permalink. I love your pictures. It’s so great to see real life and what other people get up to. It’s a window 0n on another world! I can never keep up with Layla’s social calendar! I’m so sorry to hear she’s losing her sight, I didn’t know. I look forward to your weekly posts because it seems like you live in such an amazing community, I wish I could say the same. Perhaps when we head to Toronto for 2 months with Jack things will pick up a bit. I only had cats when I lived there so it will be interesting to explore dog friendly Toronto, assuming it exists!! Sounds like you both had a fun filled and busy week! Happy to hear Layla’s check up went well. We have a busy weekend ahead celebrating our Nana’a 92nd Birthday! Happy Birthday to your Nana, wow 92 years old that is amazing. I’m glad you and Layla had such a wonderful week. There are so many great activities in your area. As always, I loved your photos. That sounds like a great week! I love new discoveries, too. Japan town sounds like an interesting visit. I’m glad your checkup went well. How fun that the police cooked for you. I saw a photo of you with an officer, on Facebook. Sounds like lots of fun! I’m glad Layla’s checkup went well but am sorry about her eyesight. My oldest boy we think is starting to not see as well. He’s ok during the day but can’t seem to see as well as he used to at night. 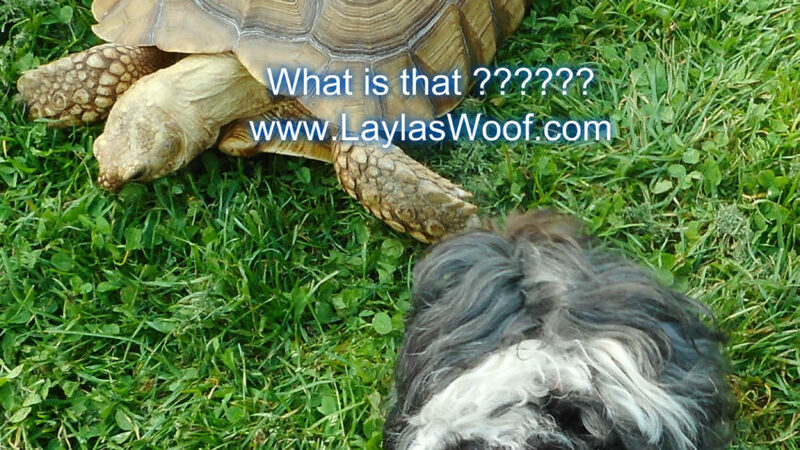 I love all your pictures, especially the one with the tortoise! We have two pet tortoises here, but they are still young and a lot smaller than the one in your picture. Wow, you had quite a fun filled week you guys! I love how you have so many community events that Layla is welcome at, and the Firemen cooking for the community OMG!! That is amazing. I’m sorry about Layla’s vision issues but I know she is well taken care of and will go through it gracefully. You always have such cool adventures. What a full weekend. What was the resource the vet gave you about diet? I’m in research mode for my cats too. I LOVe the officer holding Layla. My favourite picture!!! Wow that is a busy fun weekend. Kilo would complain as he prefers to be at home or on safe turf (no strangers or dogs). I like getting out. Love the idea of the community barbie. Thanks for the update Layla! I like how mom thinks. Take it easy and relax. I’m happy to hear you have a good bill of health and know mom is at ease. Hmm my past week was busy busy busy. I hope it’s a little calmer this week. I’ll have to take a note from both of you and head to bed early! Have a good week. You two are so busy! It looks like the street fair was wonderful. I’ll be curious to see what your new diet is. 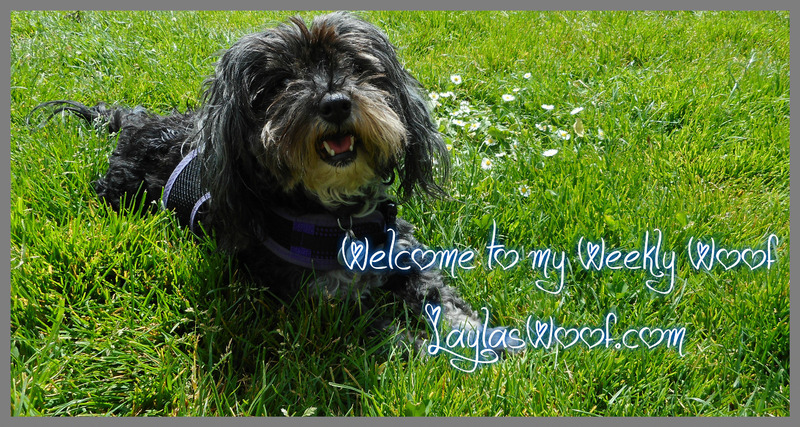 So happy to hear that Layla‘s vet visit went well. I am amazed at all the wonderful activities and events you find that are dog friendly. Hope you have a great week. Layla sure had a busy week with lots of treats. I’m glad the vet gave her a clean bill of health. I hope her eye does not deteriorate too fast. I know how that can be since Buffy has gone blind in the past year. Even a little vision is much better than blindness. What a busy weekend! Mr. N went with me to a street fair this weekend. I didn’t bring his backpack but I should have.